GoFly Prize competitors are making the impossible possible. Our community is made up of more than 3,500 innovators from over 100 countries, and our winners represent a truly international effort to make people fly. Their challenge? Our participants have been tasked with designing a personal flying device capable of safely transporting a person for 20 miles without refueling or recharging with vertical, or near vertical take-off and landing capability in Phase I, building the aircraft in Phase II, and participating in a Final Fly-off showcase at the end of Phase III. With $2 million on the line across three phases, guidance from our Masters and Mentors, and access to valuable benefits from our partners, our winners are ready to make history. 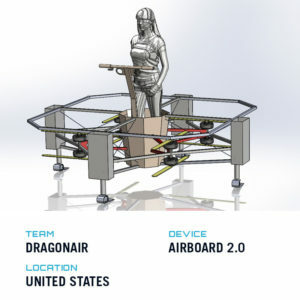 Team’s Device Description: FlyKart 2 is an electric, single-seat, multi-rotor, ducted-fan, VTOL aircraft designed to be inexpensive to build, own, and operate. Team Captain: Robert Bulaga is the president and chief technical officer of Trek Aerospace. Bulaga is an expert in ducted propeller technology and currently works with a number of companies on integrating this technology into their platforms. He has participated in the design and development of numerous aircraft over the past 30 years and has developed CFD code for designing shrouded propeller assemblies in conjunction with Stanford University. Jose Fierro (Business management, electronics, flight test) — Fierro runs business development, program management, and flight testing for Trek Aerospace. He has helped Trek focus on commercial applications and recently was instrumental in helping Trek prototype a key technology demonstrator under-cost and ahead of schedule. He is a retired Marine Corps F/A-18 Pilot with multiple combat deployments, and military experience as Director of Risk Management, Maintenance, and Operations. He has experience building and flight testing aircraft. Fierro has licenses for CFI, ATP, Remote Pilot. He received an M.B.A. from the Haas School of Business, UC Berkeley, an M.S. in Electrical Engineering from Stanford University, and a B.S. in Electrical Engineering from Stanford University. Team Captain: Dr. Moble Benedict is an assistant professor of aerospace engineering and founder of Advanced Vertical Flight Laboratory (AVFL) with 15 years of experience in VTOL aircraft concepts. He was awarded the 2012 AIAA Young Engineer-Scientist Award, the 2016 AHS Bagnoud Award and won the $25K Grand Prize at the Lockheed Martin Innovate the Future Global Challenge. 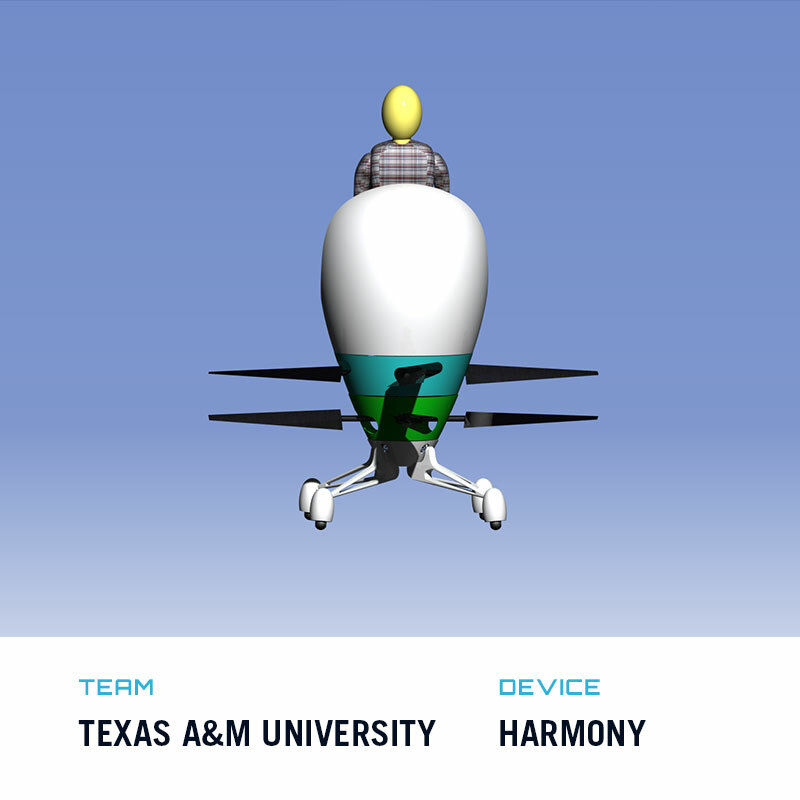 Mr. David Coleman (member, CAD drawings, feedback control implementation on autopilot for sub-scale Harmony) is a PhD student conducting research at AVFL, TAMU on a robotic hummingbird concept, which he has designed, built and flight tested. He has won numerous awards for his work and was one of the semi-finalists for the 2018 MIT Lemelson Award. Mr. Hunter Denton (member, contributed to the design, build and flight tests of the sub-scale model) is a Masters student in AVFL, TAMU. He has designed and built numerous small scale, coaxial helicopter systems including a Harmony 1/8th scale prototype. Dr. Eric Greenwood (member, rotor acoustics analysis) received a PhD in Aerospace Engineering from the University of Maryland and is a researcher at NASA Langley developing rotor noise modeling methods and experimental techniques. He was awarded the NASA Early Career Achievement Medal in 2017 and the 2018 AHS Bagnoud award for this work. Mr. Atanu Halder (member, rotor aero-acoustic design optimization) is pursuing his PhD in Aerospace Engineering at TAMU. He works at AVFL developing design framework of next generation VTOL UAVs based on a novel cyclorotor concept. He won best paper award at 2017 AHS Forum and Vertical Flight Foundation scholarship in 2018. Dr. Vikram Hrishikeshavan (avionics and controls) is an Assistant Research Scientist at the University of Maryland with 14 years of experience in VTOL aircraft concepts. He was awarded the AIAA Young Engineer-Scientist Award in 2015 and $20K first place in the Sergey Brin Foundation competition for innovation in hybrid air vehicle technology in 2018. Dr. Vinod Lakshminarayan (member, rotor CFD simulation) is a Research Scientist at Science and Technology Corporation, NASA Ames Research Center. He is one of the primary developers of the high performance computational software, Helios, which is used for design and analysis of complex rotary wing systems at DoD and US helicopter companies. Mr. Bochan Lee (member, flight dynamics and controls modeling + flight simulator) has 7 years of experience as a S. Korean Navy UH-60 pilot and a current graduate researcher at AVFL, TAMU working on autonomous helicopter ship landing. He won the 2018 Vertical Flight Foundation scholarship. Mr. Carl Runco (member, control system design) is a PhD student at the Advanced Vertical Flight Lab of TAMU and has several years’ experience designing, creating, and flying one-of-a-kind VTOL rotorcraft. This hands-on experience will be valuable in realizing the flight capable model from our design. Mr. Farid Saemi (member, electric systems design/modeling and avionics) is PhD student at TAMU. He works at AVFL and his research is focused on developing physics-based motor, controller and battery models. Mr. Vishaal Subramanian (member, blade structural design and stress analysis) is a Masters student at the Aerospace department of TAMU. He has participated in SAE Aero Design competitions from 2014-2016. Ms. Aswathi Sudhir (member, composite blade modeling) is a PhD student in Materials and Structures from Aerospace department of TAMU. Her research focus is on computational damage mechanics in composite materials. 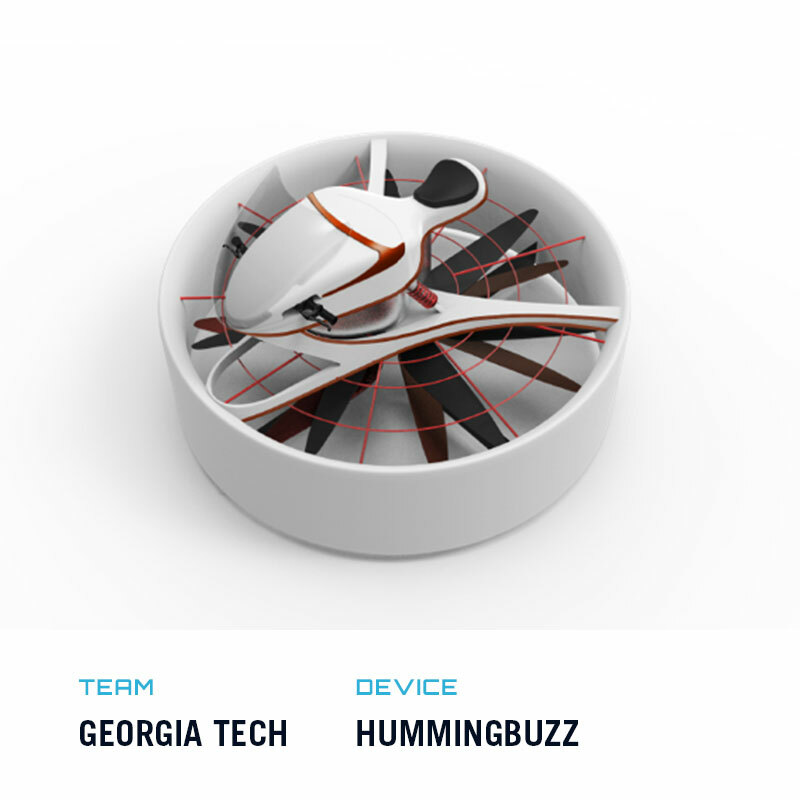 Team’s Device Description: The Silverwing concept is a fully electric flying motorcycle. 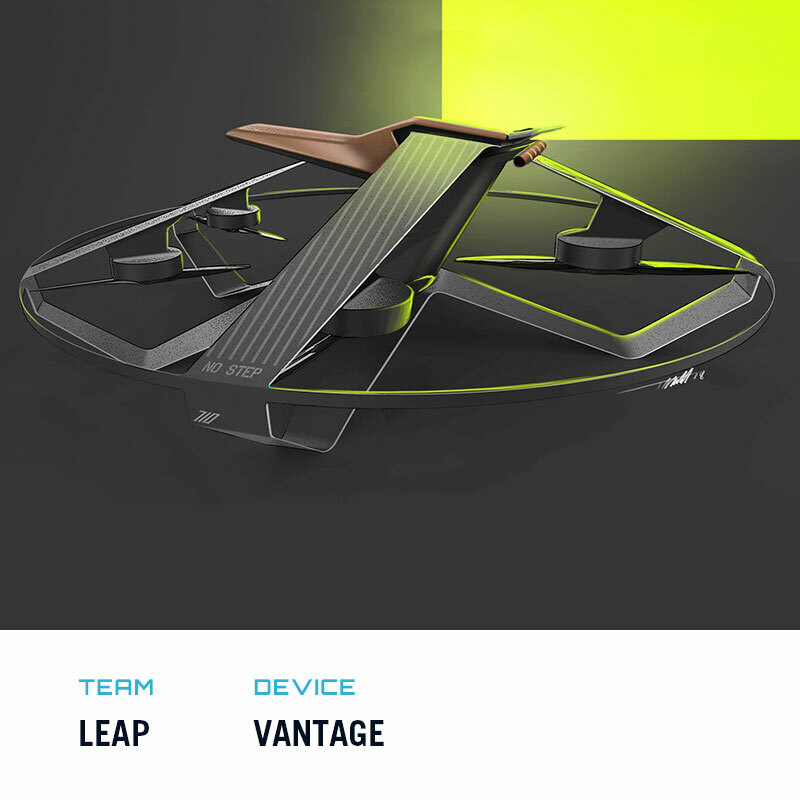 The passenger experiences exhilarating speed and freedom sitting in a racing position as the device autonomously transitions between take-off, horizontal flight and landing. 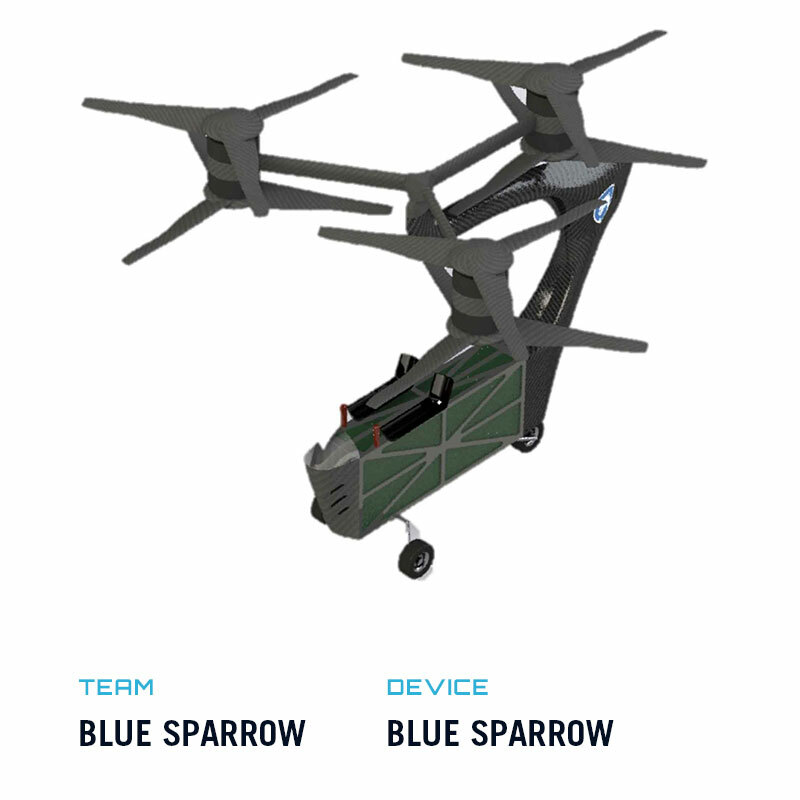 The main features of the device are two electric ducted fans, a passenger shell for safety, and the landing gear and battery pack integrated into the wing. Team Manager: James is an Aerospace Engineering graduate who previously worked on control and software in the Delft Hyperloop team. James has taken the role of Team Manager overseeing the project while gaining a great experience while working with a vast number of team members to create a high-tech product. Technical Manager: Victor is an Aerospace Engineering Master’s student with a fascination for the propulsion of aircraft. His engineering experience ranges from something as subtle as electric satellite propulsion during his internship at OHB to as radical as Silverwing’s flying motorcycle. Thom van den Homberg (Chief Structures) – Thom is a Mechanical Engineering student who has worked on numerous projects due to his passion for creating and building. The GoFly competition is the biggest project and challenge he has faced so far, but he is committed to overcome this challenge as he wishes everyone to be able to experience the feeling of personal flight. Ruben Forkink (Chief Partnerships and PR) – Ruben is an ambitious Aerospace Engineering student with a fascination for the aviation industry, and he genuinely believes that personal flight is the future. This is exactly why he is diving deep into the aviation industry, and many other industries, looking for partners for Silverwing to collaborate with. Quint Houwink (Chief Aerodynamics and Propulsion) – Quint is an Aerospace Engineering graduate with experience in creating test setups for magnetic suspension in the Delft Hyperloop team. Following his success at Delft Hyperloop, compounded by his dedication to sustainability, he decided to take on a new challenge and work on Silverwing’s aerodynamics and propulsion. Olivier Witteman (Chief Electrical Power Systems) – Olivier is an Aerospace Engineering student who previously gained hands-on experience by designing and building the battery packs in Delft Hyperloop. He joined team Silverwing in the GoFly competition because it brings together engineering and design to the extent of creating a product that he believes will transform the world of transportation. Ralph Krook (Chief Flight Control Systems) – Ralph is an Aerospace Engineering student specializing in control and simulation. He has previous experience from his internship at Rolls-Royce Motor Cars in the UK and on aerodynamics design with the Human Power Team Delft & Amsterdam. He’s excited to be participating in the GoFly challenge with Silverwing and Boeing to be part of the future of aviation. Frederik Hogenbosch (Control Systems Engineer) – Flight has always mesmerized Frederik, but he understood that in order to fly, you have to understand the physics behind it. Therefore, as an Applied Physics student, Frederik has joined Silverwing’s control systems department to make his dream a reality. Ivan Kalkman (Structural Engineer) – Ivan is a student who loves putting his Mechanical Engineering knowledge into practice with high-tech projects. The GoFly challenge has given him the opportunity to work on a project that will not only transform his theoretical knowledge into practice, but also create a working aircraft. Alex de Bont (Structural Engineer) – Alex loves to take on new projects alongside his Mechanical Engineering study to further challenge and develop himself. This passion for self-improvement led him to join Silverwing, where he works on improving the structural integrity of the device, and thinking of innovative ways to avoid a snowball effect in the design. Akash Pandey (Aerodynamics and Propulsion Engineer) – People say Akash has a healthy obsession with aviation which resulted in him studying Aerospace Engineering, and even running a blog about the world of Aerospace. With an eye for opportunity, Akash joined Silverwing in the aerodynamics department, where he works on increasing the vehicles efficiency and reducing the vehicle’s noise emissions. Art van Liere (Control Systems Engineer) – With a background in Aerospace Engineering, Art joined Silverwing to help develop a complete and reliable control system for Silverwing. In fact, his passion for software and programme development led him to leave his aerospace path behind, and start a Pre-masters in Computer Science. Barbara Schneider (Business Developer) – Integrating innovations within society is something that has always caught Barbara’s eye. This is why, as a management of technology student, Barbara joined Silverwing to work on the business-related aspects of Silverwing, as she believes that sustainable methods of transportation are the key to a promising future. Bernd Rietberg (Business Developer) – Bernd has graduated in Applied Physics, but he has always had a passion for high-tech entrepreneurship. 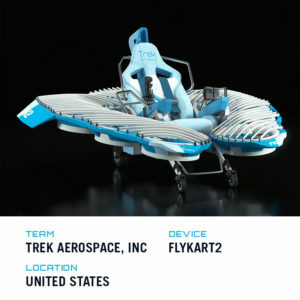 He’s inspired by the complex physics of creating a flying apparatus, and dreams of the potential that personal aircrafts could bring to the world. He is currently occupied with envisioning how Silverwing could be brought into the world through business development. Christopher Groen (Financial Officer) – Christopher is an intuitive Aerospace Engineering student working towards a Master’s in Control and Simulation. 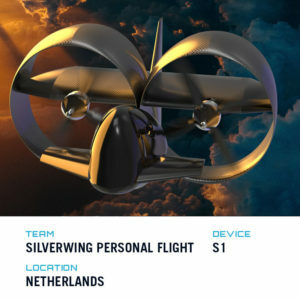 Before joining Silverwing, Christopher spent a year at Forze Hydrogen Racing Team Delft, offering him great experience to work as a financial officer on a personal flying device. Daan van Aken (Aerodynamics and Propulsion Engineer) – As an enthusiastic and determined Aerospace Engineering student, Daan has the energy to keep on track with his study, help tutor younger students, and work on Silverwing simultaneously. At Silverwing, he is hard at work modelling the aerodynamic performance of the vehicle. Hessel Tijseling (Structural Engineer) – Hessel is a Mechanical Engineering student, with a focus on high-tech engineering. He is in charge of Silverwing’s hands-on work by crafting the most important and complex parts of our electric aircraft. Jorrit van Berkom (Legal Officer) – Jorrit is a law student who wants to specialize in civil law. He has always had a passion for cars, but once he spotted Silverwing, he became intrigued with how Silverwing could affect mobility. Jorrit is an essential addition to the team due to his legal background and his entrepreneurial interest, since one of the GoFly competition requirements includes becoming a company. Jurjen Kroese (Control Systems Engineer) – Jurjen is an Aerospace Engineering Master’s student with the objective to further improve his practical engineering skills. Control of a flying vehicle is crucial, which requires sophisticated sensors that Jurjen is enthusiastically working on in order to provide us with safe and reliable aircraft. Lucas Haag (Partnerships Developer) – Lucas has always had a great interest in technology and so pursued his studies in technology policy and management. His longing for speed, along with his interest in technology makes him a perfect addition for the Silverwing team. Lucas is in charge of informing the outside world about the major shift in the mobility landscape that Silverwing is about to bring. Lucas Jacobs (Filmmaker) – Lucas is a film student and aspiring producer and director. He has previously worked on various films, but now he has joined Silverwing with the purpose to capture and share Silverwing’s boldness through film. Marcel Kempers (Creative Designer) – Marcel is an Aerospace Engineering student with a strong interest in drones and design engineering. With a background in arts, he is using his creative and engineer skills to create the coolest conceptual design of GoFly’s competition. Marten Wijnja (Structural Engineer) – As someone pursuing a Master’s in High Tech Engineering, Marten Wijnja is a perfect fit in the structures department of Silverwing. With a great work ethic, he balances Silverwing with a side job as a car mechanic and being in the Dutch army reserves. Nayan Jainandunsing (Powertrain Engineer) – As an Applied Physics Master’s student, Nayan has a special interest in batteries, finding projects to work on, such as making a battery pack for an electric bike. 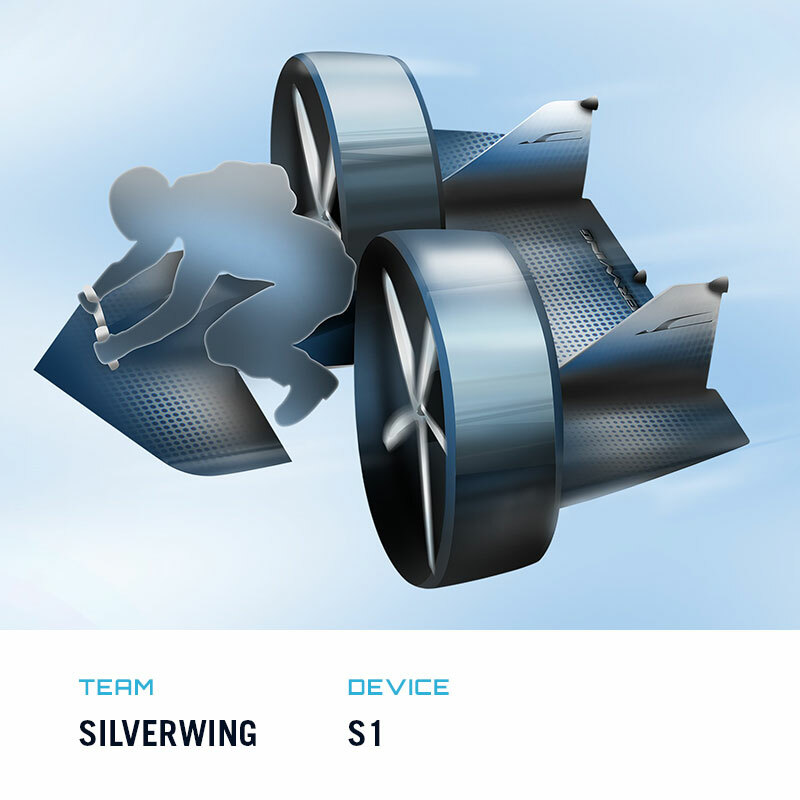 The most current project that he has found to satisfy his interest is Silverwing, which focuses on building a battery pack that will supply enough energy in order for him to fly himself, so that he no longer has to bike! Nisarg Thakrar (Structural Engineer) – Nisarg is an Aerospace Master’s student with a focus on structures and materials. Previously, he was the project manager for a formula student team in Australia, successfully competing to design a high performing race car for multiple years. Currently Nisarg decided to take on another structures and materials challenge by working with Silverwing. Oxana Oosterlee (Control Systems Engineer) – Oxana is an Electrical Engineering Master’s student whose passion for electronics led to her being in Delft Hyperloop for a year, where she worked hard with her team on a high-speed transportation system. With a taste for innovative products, Oxana decided to work on the control systems of Silverwing in order to have highly stable aircraft that can withstand the winds of the Netherlands. Rutger Brouwershaven (Creative Director) – Rutger is an Industrial Design Master’s student who worked on the interior and exterior design for Delft Hyperloop. In fact, he dreams of building vehicles that can transport people from A to B in innovative new ways that challenge the current norm. He is excited to work together with the other team members of Silverwing to create a great new travelling experience. Smit Shukla (Powertrain Engineer) – With a passion and curiosity for start-ups, Smit ended up joining Silverwing to work towards a more sustainable Earth. This passion and curiosity, combined with his Master’s in Electrical Power Engineering, lets Smit play a crucial role in the design of the vehicles electrical subsystem. Suryansh Sharma (Control System Engineer) – As an Embedded Systems Master’s student, Sury gets absorbed by programming, 3D printing, and tinkering with electronics. Therefore, he took on the challenge to join Silverwing, where he works on making the device autonomous and manoeuvrable. Teresa Blanco (Control Systems Engineer) – Teresa understands that safety is Silverwing’s main priority, which is exactly why she joined the control department to work on the stability and controllability of the device. Along with her Master’s in Embedded Systems, this is her moment to apply everything she has learnt in an innovative and dynamic environment. Timothy van der Duim (Aerodynamics and Propulsion Engineer) – Timothy is an Aerospace Master’s student with a yearning for adventure and new challenges. He saw Silverwing as the perfect opportunity to challenge his engineering skills and construct a vertical take-off and landing aircraft. Tom Suys (Powertrain Engineer) – Tom is an Aerospace Master’s student with an affinity for building. Whether it flies or not, Tom can build it. Combined with his passion for flying, Tom joined Silverwing to work on the powertrain of the design, and to ensure that the vehicle is as sustainable and efficient as possible. Victor Poorte (Structural Engineer) – Victor Poorte is an Aerospace Structures Master’s student that actively works on aerospace projects in the university. Nevertheless, he searched for a more ground-breaking project in which he could be part of building an innovative aircraft. The structure of an aircraft has to be able to withstand high loads and Victor has taken the challenge. 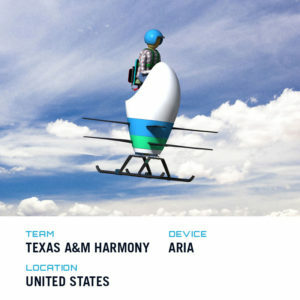 Team’s Device Description: Airboard 2.0 is an all-electric, heavy lifting, self-stabilizing, multi-copter that carries a single passenger in a standing position. Team Captain: Mariah Cain (Project Manager) – Experienced in administration and project management. She loves engineering, creating, and bringing ideas together in an organized manner to formulate the bigger picture. Mariah is a trained hydroflight athlete and has a passion for all types of flight. She is not only the experimental pilot for this new device, but also the technician. Jeff Elkins (Lead Engineer) – Comes from a multi-disciplined engineering background including electrical, chemical and mechanical. Jeff specializes in rapid prototyping, and has done work with everything from prosthetic limbs to high-powered watersports equipment. Those closest to him, refer to him as a “Mad- Scientist” due to the constant innovations he creates. Ray Brandes (Design and Mechanics) – Ray is a machine designer, computer programmer, and highly skilled at mechanical engineering and composition. He is journeyman tool and die maker for the state of New Jersey, and owns and operates a machine shop in Florida. His hobbies include the rebuild and restoration of vintage automobiles, high power rifle marksmanship, and competitive kite making and flying. 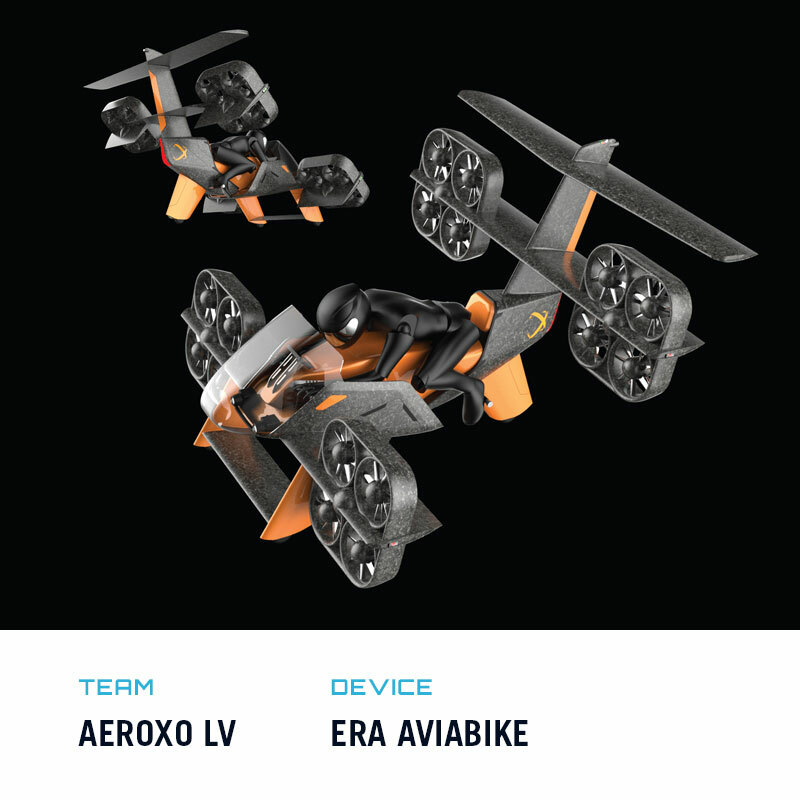 Team’s Device Description: ERA Aviabike is a tiltrotor aerial vehicle type that combines the VTOL capabilities of a helicopter with the range and speed of fixed-wing aircraft. 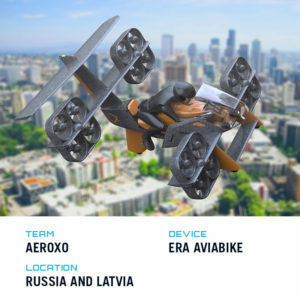 ERA Aviabike is a flying bike. Team Captain: Vladimir Spinko is Aeroxo’s chief operating officer, with multi-year experience in technology, venture capital, and unmanned aerial vehicles (UAVs). Eldar Razroev — Aeroxo CEO & co-founder, ERA tiltrotor concept inventor. Serial entrepreneur with multi-year experience in aviation technology. Ilya Golubovich — Co-founder and Chief strategist. Multi-year experience in tech VC (managing partner of international US-based VC fund). Aleksander Remizov — Software developer/architect. Developed control system for all Aeroxo’s tiltrotors (UAVs). Adel Khaliullin — Aeroxo’s lead technologist and a lead pilot. Expert in manufacturing technology and UAV pilot. Vitaliy Grishanov — Chief aerodynamics researcher. Multi-year experience in science and research. Vitaliy leads theoretical development, modelling, and early stage experiments (i.e. aerodynamic tube experiments). Andrew Ukhnevich — Power electronics developer. Since he joined the Aeroxo team and redesigned its power electronics, the Aeroxo UAV failure rate has decreased by an order of magnitude. Fedor Zagumennov — Electronics engineer. He joined the Aeroxo team as a final year bachelors student three years ago (UAV development). Aleksander Krasnov — Designer who turned our technical concept into a product. Multi-year experience in motorbike, automotive and industrial design. Roman Chernitsky — Design engineer responsible for general and interior design, material strength calculation and analysis, and special nodes and mechanisms design. He also supports the manufacturing process and helped us build the prototype in record time. Team Captain: Vladimir Spinko is the ERA Aviabike chief operating officer with multi-year experience in technology, venture capital, and unmanned aerial vehicles (UAVs). Fedor Zagumennov — Electronics engineer. He joined Aeroxo team as a final year bachelors student three years ago (UAV development). Aleksander Krasnov — Designer who turned technical concept into product. Multi-year experience in motorbike, automotive and industrial design. Team Captain: Jack W. Langelaan is a associate professor of aerospace engineering at Penn State University. Langelaan holds a B.S. from Queen’s University (Kingston, Canada), an M.S. from the University of Washington and a Ph.D. from Stanford University. His research focuses on state estimation, path planning, and flight control applied to unmanned air vehicles. Eric Johnson — Co-captain. Professor of aerospace engineering at PSU; with B.S. from the University of Washington, M.S. from MIT and GWU, and Ph.D. from Georgia Tech. He is an instrument-rated private pilot with 23 years of experience in guidance, navigation and control research and development; with particular emphasis on helicopters, multirotors, fault tolerance, and flight validation. Amy Pritchett (Human factors and flight safety) — Professor and head of Aerospace Engineering at PSU; S.B., S.M., and Sc.D. from MIT. Dr. Pritchett served as Director of the Aviation Safety Program at NASA from 2008 to 2009. Her research focuses on the intersection of automated and intelligent technologies, expert human performance and safety-critical operations. ZhouZhou Chen — Majoring in aerospace engineering, graduating with B.S. in May 2018. Minoring in Information Science Technology for Aerospace engineering. Researched in rotorcraft de-icing with Dr. Jose Palacios and where his primary focus was on aircraft controls. John (Jack) Ciraulo — From Warren, NJ; he will be graduating in May 2018 with a B.S. in Aerospace Engineering. Mostafa Elghorab — Majoring in aerospace engineering, graduating with B.S. in May 2018. Currently the president of Aero Design Club and learning assistant for an aerospace class. Researched in rotor noise analysis with Dr. Kenneth S. Brentner. Primary focus on aircraft performance. Wei-Cheng Hsu — Majoring in aerospace engineering, graduating with B.S. in May 2019. Minoring in Information Science Technology for Aerospace engineering, and researching robotic simulation with Dr. Alan Wagner. Main focus on SolidWorks and Aircraft Design. Alberto Spagnoli — Majoring in Aerospace Engineering, graduating with B.S. in May 2018. Primary focus is engineering design. Won engineering design competition for ArcelorMittal under professor Wallace Catanach. Jamil Wen — Majoring in aerospace engineering, graduating with B.S. in May 2018. Currently secretary of Aero Design Club. Primary focus on 3D modeling (SOLIDWORKS, AUTOCAD), aircraft design and CFD simulations. Team Captain: Yuanxin (Adam) Shen is a PhD student of aerospace engineering at Georgia Tech. Shen obtained his bachelor’s degree in aerospace engineering at Georgia Tech and has a special interest in the area of helicopter design optimization and flight mechanics. Brian Eberle (Flight control and Stability engineer) — PhD student in Mechanical Engineering, winner of 2018 “Vertical Flight Foundation (VFF) Scholarship”. Erberle has extensive research on research and design experience in rotorcraft modeling and control, propulsion system modeling and control. Sylvester Ashok (Mentor) — Dr. Ashok is a Research Faculty member in the Rotorcraft Design Area at the School of Aerospace Engineering. He received his Ph.D. in Aerospace Engineering from Georgia Tech in 2013. Dr. Ashok has participated and mentored teams for multiple AHS design competitions. Alistair Joshua Sequeira (CFD, noise and structural analysis) — Sequeria is an undergraduate in the school of aerospace engineering. Shuyi (Suzie) Wang (aesthetics design and Human Engineering) — Wang is graduate student in the school of Industrial Design. Wang has unique work experience in aesthetic integrated human engineering design. Daniel Schrage (Safety and certification) — Schrage is a Professor in the School of Aerospace Engineering and the Director of the Vertical Lift Research Center of Excellence (VLRCOE). 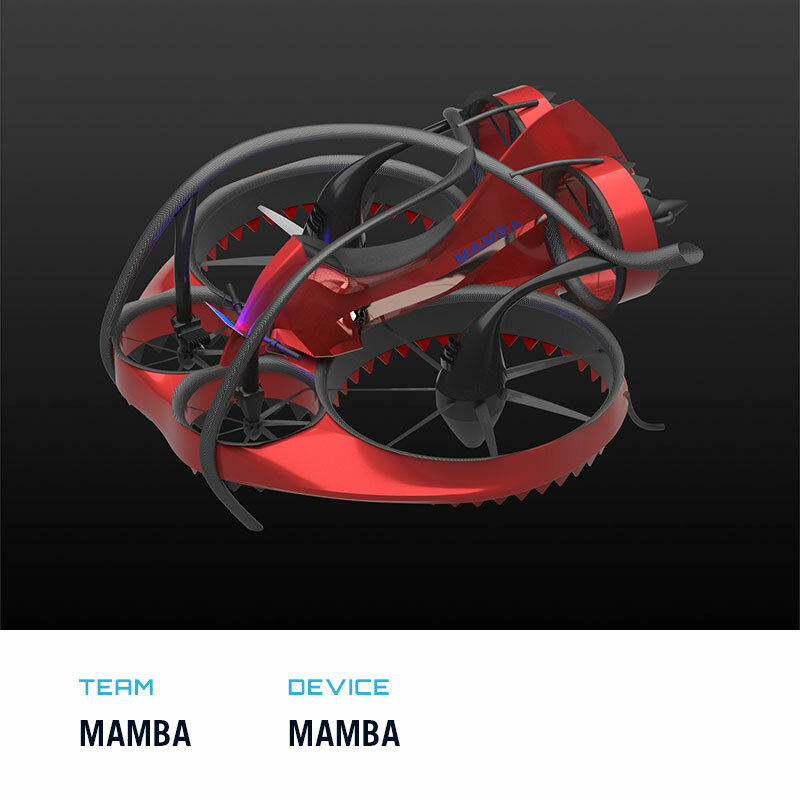 Team’s Device Description: A five-rotor airbike. Team Captain: Bruno Howard earned his degree in mechanical engineering from Imperial College London. He has founded, ran and raised funding for previous startups. He has also worked on the other side of the table, as a venture capitalist. William ‘Pat’ Branch (Product lead & head of engineering) – Pat is responsible for the development, management and execution of the overall engineering plan. As product lead, he is also responsible for signing off on most design decisions and ensuring that the design is certifiable and that safety factors are appropriate. Pat is a systems engineer and has spent 35 years working in the aerospace sector on projects such as the F-35 at Lockheed Martin, the B2 bomber at Northrop Grumman and the V-280 tiltrotor at Bell Helicopter, in which system safety has been his primary focus. Karim Gharaibeh (Powertrain & transmission) — In charge of the powertrain, it is Karim’s responsibility to ensure that the combustion engine provides the power required by the vehicle at all stages of its duty cycle. In his role, he is also responsible for ensuring that the engine is compatible with the generator in the series hybrid configuration and that its fuel consumption allows for sufficient range. With a degree in Mechanical Engineering, he is currently completing his final year of a Ph.D. in turbomachinery, in which he is investigating the onset of surge in the compressor stages of combustion engines in industrial machinery. Jakob Howard (Power & electronic engineering) — Jakob is responsible for the development of the series hybrid powertrain and the distribution of power from the PDU to the rotors. In his role, Jakob is also responsible for the selection and electronic control of the electric motors, as well as the design of the emergency reserve battery unit that provides backup power in the case of a powertrain failure. Holding a Master’s degree in engineering from the University of Oxford, Jakob has since worked as a powertrain engineer focused on high-speed actuator control and simulation, gearbox design and electromagnetic modelling, design, and testing of electric traction motors. Nikhil Aggarwal (Materials & Structural Engineering) — In charge of the vehicle’s structural integrity, Nikhil is primarily responsible for the design of the vehicle frame. His focus is on the material selection and stress analysis to ensure that safety factors remain within acceptable ranges. With a degree in Mechanical Engineering from Imperial College London, Nikhil also has several years’ experience working in the high-performance materials industry, focused specifically on the analysis and design of ballistic and heat-resistant materials for operation in extreme conditions. Philipp Seeger (Vehicle concept design lead) — Philipp works with the whole engineering team and is responsible for ensuring the concept meets not only the GoFly requirements, but also those of the market and Leap’s target customer. Holding a Master’s degree in Aeronautical Engineering from the Technical University of Munich, Philipp has nearly a decade’s experience working as a ‘clean-sheet’ concept design and systems engineer in the Defence & Space division and Future Projects Office at Airbus. Having also worked on a fuel cell UAV project at Boeing Phantom Works, Philipp has acquired the knowledge to design economically and technologically viable aircraft. Sangeet Shah (Software & vehicle control) — Sangeet is responsible for the automatic stabilisation and motor control system. Sangeet works closely with Howard to ensure that each of the motors can be appropriately under- and over-powered to compensate and provide the necessary feedback in various transient scenarios, most importantly in the case of a catastrophic failure of one of the motors or rotors. With a first class Master’s degree in Mechanical Engineering from Imperial College London, Sangeet works as a robotics and software engineer at a leading software consultancy firm. Ryan Wallace (Business development & funding) — Ryan is responsible for the business development and fund-raising efforts at Leap. 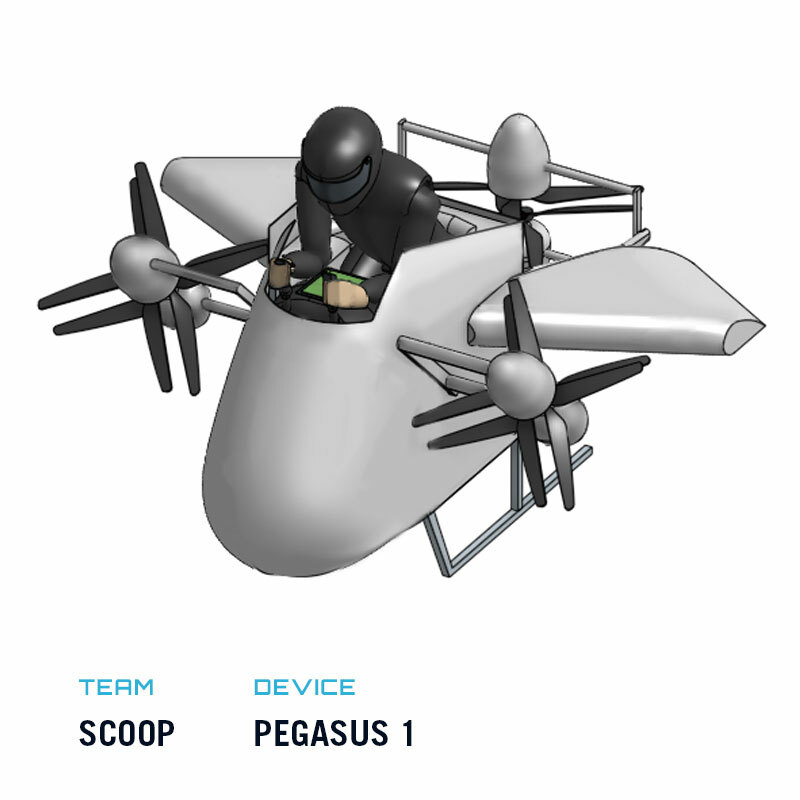 Alongside building out a network of stakeholders and potential first customers, Ryan is working to raise the capital required to enable Leap to become a contender in the personal VTOL market, following completion of the GoFly challenge. As a serial entrepreneur and alumnus of Y-Combinator, Ryan already has a large network of fellow entrepreneurs, mentors and investors. Ryan also holds a degree in electrical & electronic engineering and supports the engineering team where necessary. Team Captain: Lauren N. Schumacher a University of Kansas PhD student studying adaptive materials and guided munitions. She has worked in acoustics, advanced manufacturing, and propulsion projects in commercial aviation product development. Her aircraft design experience includes UCAV, airlifters, and electric urban air transit systems (1st PESA 2015). Ronald Barrett (Advisor) — Barrett earned Bachelor’s, Master’s and Ph.D. degrees in Aerospace Engineering from the University of Kansas and the US Army Rotorcraft Center of Excellence at Maryland. He has worked on innovative rotorcraft for more than 30 years for the US Army, Navy, Air Force, DARPA and more than 30 international aerospace corporations. Patrick McNamee (Blade design, stability) — McNamee graduated from the University of Kansas with a Bachelor’s of Science degree in Aerospace Engineering and is currently a Master’s student in Aerospace Engineering, studying cognitive control systems at the University of Kansas. Nicholas Donald Werner (Weights & balance, CAD, website, marketability) — Previously competed in an individual AIAA design competition as well as a team AIAA design competition. Graduating in May with a bachelor’s in aerospace engineering from the University of Kansas. Previous internship with Honeywell Aerospace working on flight control systems integration. Joshua Donald Mudd (Systems Design, Acoustics, Safety) — Graduating in May 2018 with a Bachelor of Science in Aerospace Engineering from the University of Kansas. Previous experience with design competitions ~ AIAA Individual Design Competition. Interests in Flight Testing and Controls. John Haug (Ergonomics, manufacturing, acoustics) — Born in Austin, TX, attended the University of Kansas to participate in the Aerospace Engineering Program for his undergraduate degree. At KU, John has garnered experience in composites layup, engine testing, aerodynamics testing, etc. Through his aircraft design professor, John heard about the GoFly Competition, and wanted to participate. Dalton Prins (Acoustics, preliminary structures, safety & regulations) — Graduating from Rockhurst High School in 2013, he attended the University of Kansas for Aerospace Engineering with a scholarship through Naval ROTC. He will graduate in May 2018 with a B.S., commission as an Ensign in the United States Navy, and begin his flight training to become a Naval Aviator. Martin Mendoza (CAD, renderings) — Mendoza is graduate student completing his M.S. in Aerospace Engineering at the University of Kansas. For this project, he worked on assembling the CAD model and producing renders of the CAD model. Ankur Patil (Structures) — As a Ph.D. student in Aerospace Engineering, he has focused on designing antennas for remote sensing of polar regions, designing and manufacturing supporting structures for radar systems. He worked on aircraft structural analysis, antenna testing and manufacturing, and designed wings for the ‘Wing in Ground Effect Vehicle’ (1st PESA 2015). Team Captain: Alex Smolen is a self-taught programmer who has experience creating and running a company. Smolen has built a full stack application and has in-depth experience with the design process. He has a bachelor’s in accounting, and experience in flying and building multicopters. Team Captain: Victor Sonneveld is a Master of Science (M.Sc.) student in Flight Performance and Propulsion in the Aerospace Engineering department at the Delft University of Technology. He is a former member of the Delft Hyperloop team, where he wired harness and braking systems. Rutger van Brouwershaven (Vehicle design & ergonomics) — M.Sc. student Integrated Product Design at faculty of Industrial Design. Former member of Delft Hyperloop team, SpaceX Hyperloop competition January 2017, vehicle interior design. Thom van den Homberg (CAD) — B.Sc. student Mechanical Engineering. Hands-on experience in robotics, like the Robohopper bio-inspired project. Quint Houwink (Control & stability) — B.Sc. student Aerospace Engineering. Former member of Delft Hyperloop team, permanent magnet levitation. Ralph Krook (Flight operations) — M.Sc. student Control and Simulation at faculty of Aerospace Engineering. Former member of Human Power Team Delft, aerodynamics engineer. Luuk van der Linde (Structures) — M.Sc.student Aerospace Structures and Materials at faculty of Aerospace Engineering. Former member of Delft Hyperloop team, chassis design and manufacturing. James Murdza (Software & simulation) — B.Sc. student Aerospace Engineering. Former member of Delft Hyperloop team, embedded software and vehicle simulation. Victor Sonneveld (Flight performance) —M.Sc. student Flight Performance and Propulsion at faculty of Aerospace Engineering. Former member of Delft Hyperloop team, wiring harness and braking system. Olivier Witteman (Power systems) — B.Sc. student Aerospace Engineering. Former member of Delft Hyperloop team, battery system. 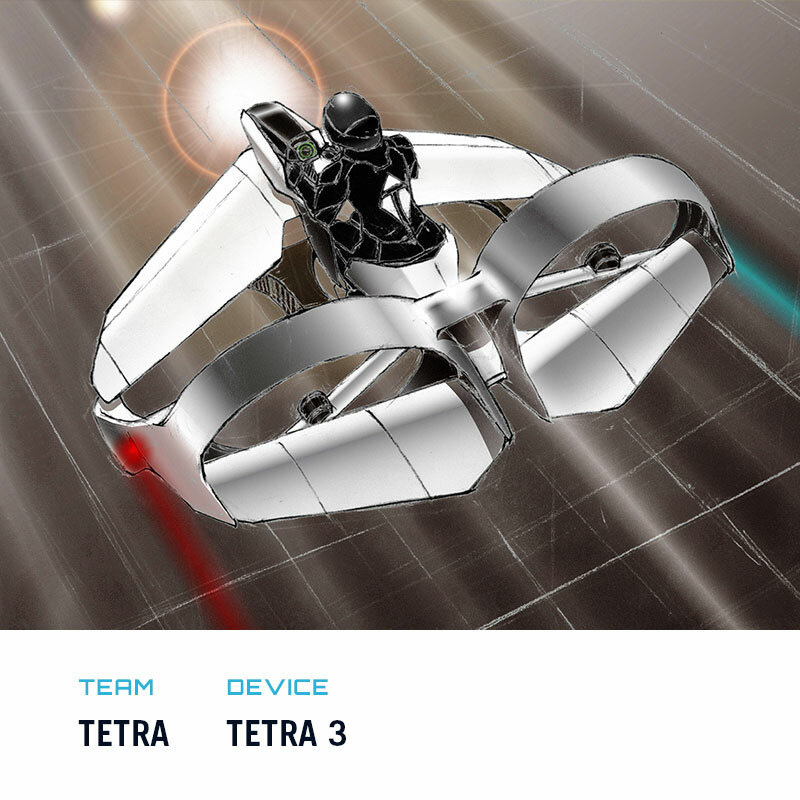 Team’s Device Description: teTra 3 is not only efficient enough, but also stylish enough for commercial requirements. Team Captain: Tasuku Nakai is a doctoral student in the department of mechanical engineering at the University of Tokyo, studying strength of materials, fracture mechanics, human injury assessment and structural design. Masaru Okada (Industrial and creative design, Electric circuit design) — ID/UX designer in Softbank Corp., former: Electrical engineer at sony EMCS Corp.
Koya Kuwamura (Aerodynamic design, Control system design) — Master of aerospace engineering from the Nagoya university, System engineer at Softbank Corp.
Akihiro Mizutani (Project management) — Certified PMP, project engineer at Civil Aero-Engine Division, IHI corporation. Tetsuya Matsuhisa (Generator design and engine system design) — Engineer at Honda R&D Co., Ltd.
Yasuyuki Shimizu (Structural analysis) — Research student in the department of mechanical engineering at the University of Tokyo. Kazunori Saito (Finance, sponsorship, funding) — Chief financial officer at iROBOTICS Inc.
Kenji Kajitani (Building, securing, property rights) — Chief technology officer at iROBOTICS Inc.
David Coleman (CAD drawings) — A Ph.D. student conducting research at AVFL, TAMU (Texas A&M University) on a robotic hummingbird concept, which he has designed, built and flight tested. He has won numerous awards for his work and was one of the semi-finalists for the 2018 MIT Lemelson Award. Hunter Denton (Built GoFly proof of concept) — A Masters student in AVFL, TAMU. He has designed and built numerous small scale, coaxial helicopter systems including the GoFly proof of concept. Nima Ershad (Electrical systems modeling and design) — A Ph.D. student at electrical and computer engineering department TAMU. He is experienced and interested in power electronics and its applications in motor-drives, design, prototyping and analysis of electrical machines and powertrains. Bharath Govindarajan (Overall design) — An assistant research professor at the University of Maryland with a focus on rotorcraft aerodynamics and helicopter design. 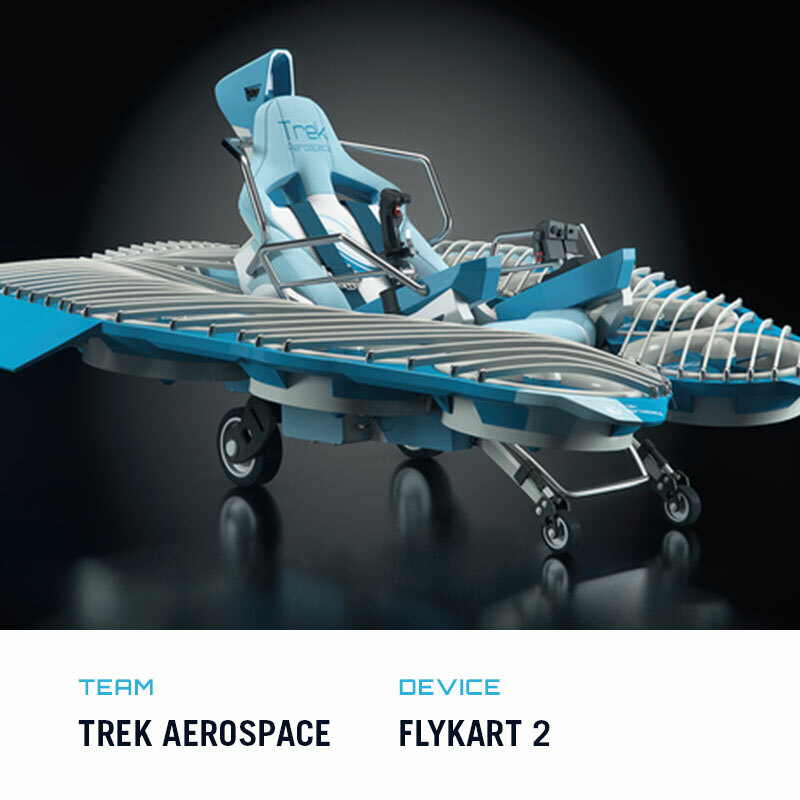 He has participated and won in the American Helicopter Society’s annual international design competition both as a graduate student and faculty advisor. Carl Runco (Control system design) — A Ph.D. student at the Advanced Vertical Flight Lab of TAMU and has several years’ experience designing, creating, and flying one-of-a-kind VTOL rotorcraft. This hands-on experience will be valuable in realizing the flight capable model from our design. Farid Saemi (Electric systems design/modeling and avionics) — A Ph.D. student at TAMU. He works at AVFL and his research is focused on developing physics-based motor, controller and battery models. Ananth Sridharan (Rotor aeromechanics modeling) — A Research Scientist at the University of Maryland, College Park. During the last 10 years, he has worked on several aspects of helicopter design, including flight dynamics and control, vibration prediction, aeromechanics, design optimization and preliminary sizing. Vishaal Subramanian (Blade structural design and stress analysis) — A Masters student at the Aerospace department of TAMU. He has participated in SAE Aero Design competitions from 2014-2016. Aswathi Sudhir (Composite blade modeling) — A Ph.D. student in Materials and Structures from Aerospace department of TAMU. Her research focus is on computational damage mechanics in composite materials. Eric Greenwood (Rotor acoustics analysis) — Received a Ph.D. in Aerospace Engineering from the University of Maryland and is a researcher at NASA Langley, developing rotor noise modeling methods and experimental techniques. He was awarded the NASA Early Career Achievement Medal in 2016 and the 2018 AHS Bagnoud award for this work. Atanu Halder (Rotor design optimization) — Pursuing his Ph.D. in Aerospace Engineering at TAMU. He works at AVFL developing design framework of next generation VTOL UAVs based on a novel cyclorotor concept. He won best paper award at 2017 AHS Forum and Vertical Flight Foundation scholarship in 2018. Adam Kellen (Rotor acoustic testing) — A Master’s student in Aerospace Engineering at TAMU. Adam’s specialties include mechanical design, CAD, and experimental testing. For the past 3 years he has worked at AVFL to understand the scalability of a novel cyclorotor concept. Vinod Lakshminarayan (Rotor CFD simulation) — A research scientist at Science and Technology Corporation, NASA Ames Research Center. He is one of the primary developers of the high performance computational software, Helios, which is used for design and analysis of complex rotary wing systems at DoD and US helicopter companies. Bochan Lee (Flight dynamics and controls modeling) — Has 7 years of experience as a S. Korean Navy UH-60 pilot and a current graduate researcher at AVFL, TAMU working on autonomous helicopter ship landing. He won the 2018 Vertical Flight Foundation scholarship. Andrew Riha (Rotor acoustics analysis) — A Masters student at the aerospace department of TAMU working on boundary layer transition. Joshua Portlock (Controls) — Portlock is the ElectroDucts Product Manager at Trek Aerospace, the Founder and Chairman at Electro.Aero Pty Ltd, and the Director and CTO at Scientific Aerospace. His research focus areas include electric propulsion optimization, VTOL flight control, autonomous navigation, sensor stabilization, payload integration and development project management. He developed state-of-the-art, ducted quadrotor, unmanned aircraft technology in 2006 and then licensed that technology to Cyber Technology to commercialize as cyberQuad. He received a B.S. in Mechatronic Engineering from the Curtin University of Technology.